To see accompanying diagram, click here. Wireless check-in appeals to stressed-out travelers looking for the quickest way to their rooms. Here's where the technology is right now. A busy traveler rushes through a hotel lobby after arriving late on a bumpy flight. An invisible device near the hotel's front door registers his arrival. He bypasses the check-in counter, glances at his cell phone, and enters a PIN. The cell phone screen shows his room number, and he heads for the elevator. When he reaches the room, a coded ID in his phone serves as a key. The door opens. Our tired traveler has just checked in, gone straight to his floor, and entered his room without losing a step. Something from the The Jetsons? Nope. This technology is here now! Wireless check-in was demonstrated recently at The Venetian Resort-Hotel-Casino in Las Vegas, during the Fall Comdex 2000 convention. InnTechnology (www.inntechnology.com), a leading provider of high-tech solutions for the hospitality industry, teamed with The Venetian to provide live demos of wireless check-in and related applications (see chart on page 40). "The Venetian is always interested in pioneering new things and being on the cutting edge of technology, to be competitive," observes Mike French, senior vice president of operations for The Venetian. "We are very excited to participate with InnTechnology in this demonstration." The Venetian serves substantial numbers of business travelers and frequently hosts large meetings of corporate groups. Travelers who've had a stressful business day are especially interested in ease of arrival. So wireless check-in is of particular interest to this Las Vegas hotel. Mac Graham, executive vice president of operations for InnTechnology, Inc., explains that InnTechnology's wireless check-in solution uses the Bluetooth standard, a high-speed protocol for wireless connectivity among computers and other communications devices. It's similar to the protocol used in handheld units for rental car returns, but it's a lower-cost, lower-power, shorter-range solution. Currently, cell phone manufacturers such as Ericsson (www.ericsson.com), Motorola (www.motorola.com), and Nokia (www.nokia.com) are incorporating Bluetooth capability into their devices, Graham says. He notes that as Bluetooth becomes more widespread, hotel guests will have this capability built into their cell phones, palm pilots, and laptops. Each device with Bluetooth has a unique ID. The guest registers the Bluetooth-compliant device a single time with each hotel chain to get a PIN. At the next visit to any hotel in that chain, the guest can simply walk into the lobby, and the device will be recognized by the hotel's PMS. The cell phone or palm pilot will display a message saying something like, "Welcome. To check-in, enter your PIN." After the PIN is keyed in, the unit gives the guest a room number. At the room, a special reader on the door receives a coded ID from the cell phone or palm pilot and asks again for the PIN. When the PIN is entered, the door unlocks. For the demo at The Venetian, InnTechnology designed and integrated the Bluetooth solution. InnTechnology also provided the central server and software to manage the following: delivery of automated check-in, control of door-lock access, capability for in-room printing, and billing of all services to the guest's folio through an interface to the Venetian's property management system. Several other hotels are implementing or investigating Bluetooth-compatible door locks for all guest rooms. Graham asserts, "We're redesigning, reengineering the data flow between the hotel and the guest. Our target is the frequent traveler," he says, someone for whom standing in a check-in line can be the last straw of a stressful business day. He refers to his company's approach as "e-personalization," because once the guest's preferences are recorded by the hotel chain, a hotel location can use electronic technology to help ensure that guests get the right kind of room—smoking or non, one-bed or two, etc. In addition to the wireless check-in application, the guest can check out of the room and print a hard copy of the hotel bill, without going to the front desk and waiting in line. HP (www.hewlett-packard.com) printers (also supplied by InnTechnology) can combine with Bluetooth to print out special messages. "We at the Venetian are looking at lots of solutions to help us offer maximum customer convenience for typical hotel services such as check-in" French says. 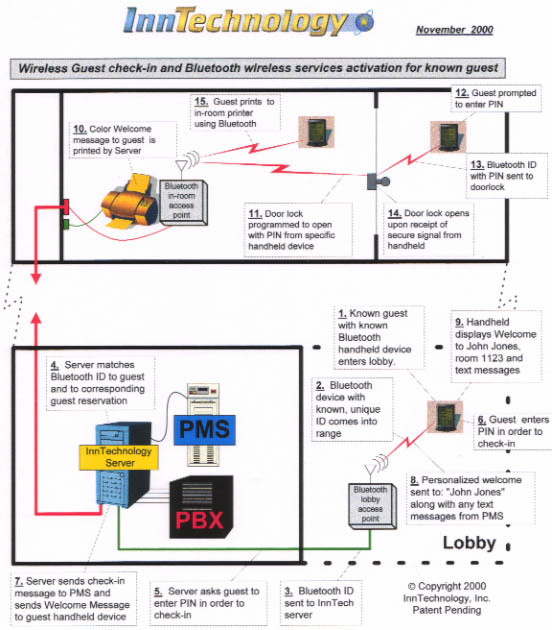 He notes that wireless check-in, as demonstrated at Comdex, is representative of actual services the hotel will consider implementing in the near future. 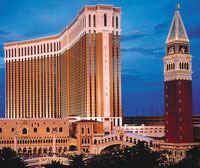 "The leadership that InnTechnology has shown in conceiving these applications enables a hotel such as The Venetian to bring these cutting-edge services into the hands of each guest," he says. A hotel that has already gone live with another form of wireless check-in is Loews Hotel at Universal Studios at Orlando. Tom Roditus, director of operations, notes that in January 2000 his organization implemented a limited form of wireless check-in technology using HIS (www.hotelinfosys.com) software and Telxon (www.telxon.com) hardware. The hotel currently uses it mainly for VIPs, although most guests have the option of choosing the wireless solution. Under the Loews wireless check-in system, a uniformed hotel service agent greets the guest at curbside and offers to perform check-in right there, using a handheld unit similar to that used for rental-car returns. Agents with the handheld devices are also stationed in the lobby. Despite the weighty handheld units that require recharging every three hours and are difficult to read in the bright Florida sun, Michael Sansbury, regional vice president and managing director at Loews Hotel at Universal Orlando, remains optimistic. He is especially upbeat about the potential of wireless check-in to reduce labor expenses. "I believe in the vision of wireless check-in," Sansbury says. "In terms of the cost, obviously the initial cost is more expensive, but our studies have showed that because of the flexibility of not having nonproductive luggage, door, or front office attendants, the total number of required staff is actually less than if you had three separate departments. That is the model," he says. "I believe technology will catch up with us. Also, obviously, as more and more buy it and it becomes mass produced nonproprietary hardware, it also will become more affordable," he says. Guest reactions to wireless check-in at Loews have been mixed, Roditus reports. "When it all works perfectly, the guest has a seamless check-in experience, with a convenient and efficient operation. But because it's new, it's sometimes confusing to the guests. And when it's not as fast as registration-desk check-in, guests can become frustrated." Implementing new technology such as wireless check-in always has its challenges, as Roditus is well aware. "We're using it, but not in a full-feature mode. We're still working with the software vendor for better, quicker functionality. It's not where we hoped it would be," he acknowledges, "but we're sticking with our efforts to bring this technology along to better serve our guests." He concludes, "We believe this is how future check-in will be delivered."